Tired of playing live dealer blackjack and other table games? There’s more ways to win at the table and baccarat variants at the live casino can prove to be one of the most lucrative methods of landing a serious jackpot. Browse our user-friendly guide below to get clued up on the basics of how to play baccarat, what to look out for and how to sharpen up your strategy. After Blackjack, baccarat is one of the most popular live dealer card games and its quickly gaining in popularity. 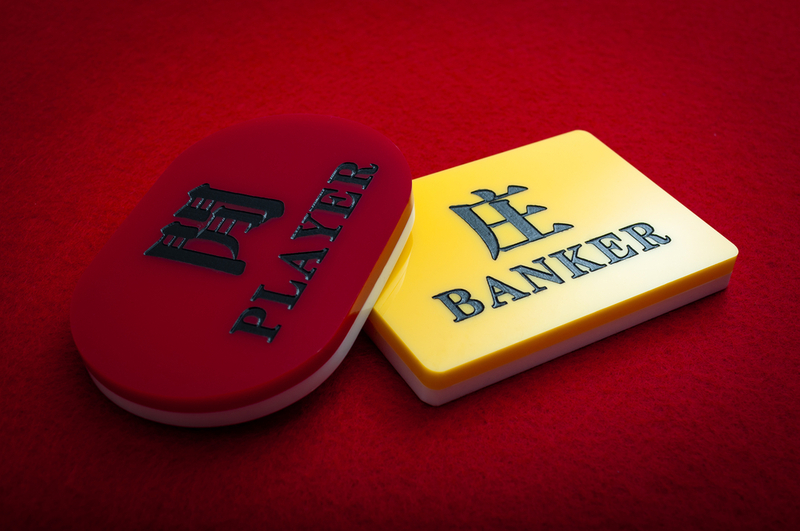 In most version of baccarat, a table is made of 14 individual players, with each participant clearly marked. On the table are three boxes in front of each individual player where they can stake their wagers, with one box reserved for bets on the banker, one for bets on the player, and one reserved for staking wagers on a tie. Each turn, players place their wager in one particular box. Cards are then dealt and displayed in the centre of the table, revealing the outcome of each turn. All each player needs to do is bet on who will win each round. It’s that simple. Understanding the card values of all baccarat variants is key when learning how to play baccarat. When playing baccarat online at a live casino, you need to add the total value of your cards together in order to achieve a total value of between zero and nine. From here, things are relatively simple to follow. Scoring a nine is the dream outcome, while landing a value of zero is a worst case scenario you’ll want to avoid. The individual values of cards are easy enough to remember. Cards from 2 through to 9 are counted with their face values, while anything from the Royal house is considered a 10. If you pull an Ace, count this as a 1. With values like this, it’s easy to get a total hand that exceeds nine. In this case, your total hand is reduced by a total of ten. When you exceed a total value of ten, the easiest way to reconfigure your play total is to deduct the first digit from your total sum. Now you’re a bit more accustomed to baccarat rules, it’s time to get clued up on the betting options available when playing baccarat variants. Unlike most card table games, including live dealer blackjack, you’re not playing against the dealer when trying your hand at baccarat. Rather, you’re playing against the ‘Banker’ or ‘Player’ in order to win, or at least draw a tie. When betting on a player to win, you have to bear in mind that a win is classified as the player ending up with a final hand that’s closest to the value of nine. Player bets aren’t the most profitable, giving you flat return on your stake. In most instances, this gives a distinct advantage to the house. When it comes to betting on the back, you’re dealing with more enticing wagers. The advantage of the house is less than betting on the player, making returns more favourable. What’s more, when playing live dealer baccarat and taking a punt on a live casino, wagering fees are only deducted from your winnings should you be lucky enough to win a bet. Bear in mind the house still holds the advantage and the banker still has a higher chance of winning, but definitely consider this betting option when you’re out to rake in some serious cumulative winnings. Ties are an even more lucrative option when it comes to wagering on live dealer baccarat. Essentially, you’re betting on the unlikely outcome that both the player and banker end up with the same value hand. The odds of this happening are wider, meaning you’ll secure a much meatier return should your bet come good. However, the house advantage is even more stacked against you here. Definitely one for the high rollers, this type of bet should only be attempted if you’ve got some serious capital to play with. Considering taking a punt on live dealer baccarat now you know the rules and variants? Knowing how to play baccarat at an online casino is only half the battle. The reality is a whole other kettle of fish. As with live dealer blackjack and live dealer poker, playing etiquette is key. You’ll need to adhere to strict play regulations, bearing in mind that some of the players you’ll be interacting with will be staking huge sums of cash on single bets. When you’re dealing with these high rollers at a live casino, bear in mind the operator might be enforcing baccarat variants. Make sure you’ve read the small print and understand the differences before delving in. When you’re dealing with smaller amounts, or playing baccarat variants like mini baccarats, expect a faster, often relentless pace. Get used to making your wagers at breakneck speed at times, and don’t start something you don’t intend to finish. Regardless of how high or low the stakes, it still pays to remember basic courtesy and a professional etiquette. If you’re entering into a live casino with a strategy you intend to use for some time, you’ll want to leave a good impression.